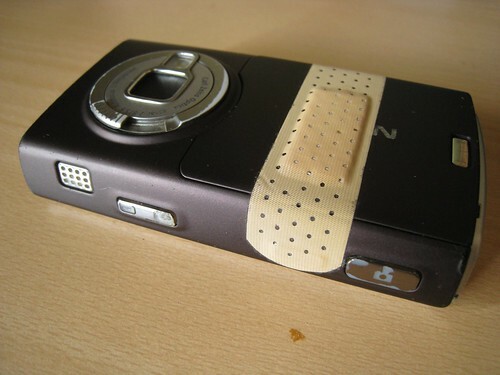 Just for posterity, I thought I ought to show off my stylish N95. It's been wearing that Handyplast/Band-aid for close to a month now. I've dropped the phone enough times that the battery cover won't stay on anymore, so in Vietnam I slapped on a piece of masking tape as an interim measure. That eventually lost its adhesive qualities, plus it was leaving some sticky residue on the phone, so I switched to this more elegant solution. I thought I would have a new phone by now, but the one I want hasn't been on sale since I got back, so the N95 will have to do for a while longer. I think you will start a trend.